This bred originates from the Little River district of Nova Scotia and was initially called the Little River Duck Dog. The name was changed to Nova Scotia Duck Tolling Retriever, and Toller for short - this breed is comparatively rare. The dog would toll (to lure or decoy game) by arousing curiosity}, lure, and retrieve waterfowl by playing on the edge of the water. As the waterfowl would slow down, stop or go a bit closer to see what was happening, the hunter had his gun ready. 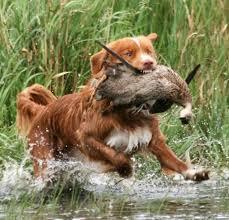 The Toller (common name for the breed)would then go and retrieve the bird. If your looking for a coach potato - not for you! This is a working dog that needs at least an hour of exercise a day, plus somewhere to run and play, which must be fenced. Due to what the dog was bred for, a good idea to stimulate is to throw sticks and balls for it to retrieve, especially in the water - this helps to satisfy the natural instincts. If this dog does not receive the mental and physical stimulation it needs, it will be bored and frustrated and behaviour concerns such as destructive behaviour can occur. Overall they are friendly, but may be a bit wary when meeting new people. As with all breeds, puppy socialization should be undertaken, followed by continued socialization to put in place a solid social foundation. They are very alert dogs and will let you know if somebody is approaching your home or your car, if inside it. In addition to hunting, they are great at agility, dock diving, and due to their intellignece, desire to work and scenting abilities, they do very well in search and rescue. If you are going to have this dog in your life, you really should find a way in which to get it to work, such as above. They are not hard to train as love to please their owners, however, being such an independent dog, they can be stubborn. Training methods such as positive reinforcement should be used. On average the Toller does not tend to be aggressive to other dogs, however you must make sure that your dog has been well socialized so that it will accept another dog into the home. Although the Toller can get on well with the family cat if introduced as a puppy, due to their strong prey drive, they will chase other cats and any other small animals around. ​Adults are typically gentle dogs, particularly with children, however all dogs should be socialized with children of all ages from puppyhood and the socialization continued, especially for a family dog. By the same token, all children should be taught how to approach and interact with a dog and to treat it with respect.